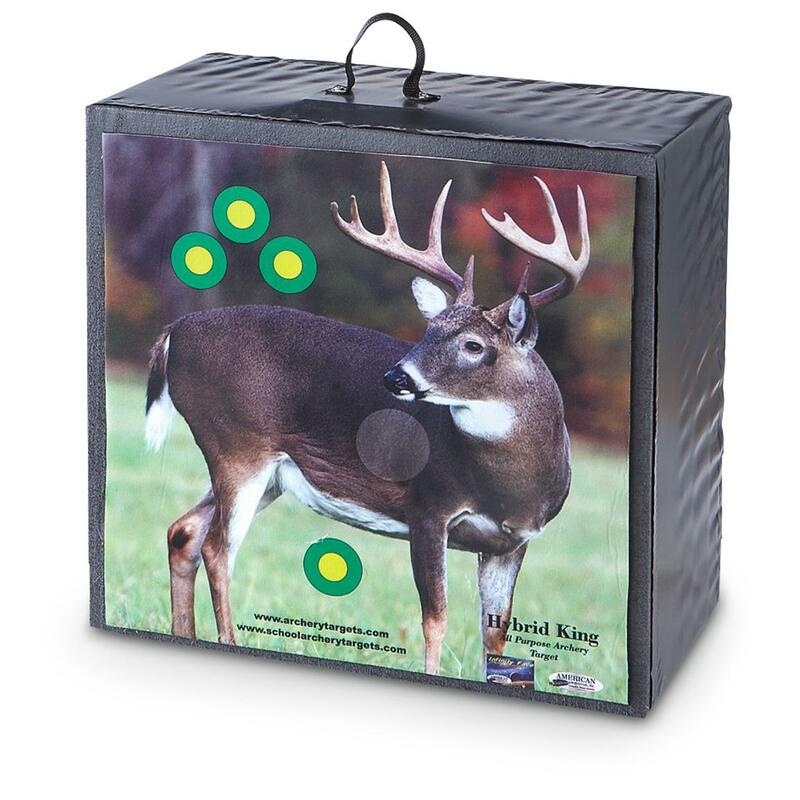 Hone your archery skills with a durable self-healing Target from American Whitetail®. Built to stop arrows launched at up to 300 FPS, this Target can take a beating and then some. Its innovative inner material makes arrow removal a snap, and the Target won't turn to confetti each time you remove your broadhead or field point. Measures 18.5"h. x 18"w. x 9"d.
Dimensions: 18.5"h. x 18"w. x 9"d.
American Whitetail Hybrid King Archery Target is rated 4.0 out of 5 by 43. Rated 2 out of 5 by Mark from Unglued The target absorbs well but I used it once and the face came unglued. Rated 5 out of 5 by Daryl from VG Target is just what I wanted, portable, very good price, what more could you ask for? Rated 3 out of 5 by snowdoug1 from Does just as the ad says... however after shooting about 50 arrows into it, the target area no longer stop the arrows as well as initially. Rated 1 out of 5 by John N from Waste of money! This thing is glued together.Cheap derocative cover came off while pulling the 1st group of arrows out.I can't understand how anyone could actually use this more than once orhow others can give it a high rating. This is the 1st neagitve review I have made on any product. I feel strongly about the poor quality. Rated 3 out of 5 by doughboy from Not what I hoped Finally got to use this target. Wish I checked after my first shot - all six bolts buried up/into fletching. After some getting enough bolt to grip by pressing the bolts/target against a wall, the bolts did come out relatively ok (I used lube on the field points), but the fletching were all basically ruined. Guess I shouldn't have pushed the 300 fps (shooting 330 fps). Rated 3 out of 5 by ADRIAN from The picture on the target was falling off right out of the box. I just taped it back on.